Classic Cuisine was awarded the Most Outstanding Caterer for BOP in the 2015 Wedding Industry Awards - Tauranga / Bay of Plenty's first choice in catering. three profiles were found for Classiccuisine.co.nz in social networks. Among other social networks the website is represented in Facebook, GooglePlus and LinkedIn. 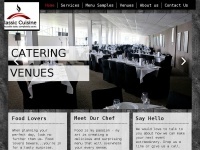 The web server with the IP-address 120.138.18.115 used by Classiccuisine.co.nz is owned by SiteHost New Zealand and is located in Auckland, New Zealand. This web server runs a few other websites, mostly in the english language. The websites were created using the programming language PHP and they are hosted on a Apache server, which runs on the operating system Debian (Linux). The content management system WordPress is used. The HTML pages were created with the latest standard HTML 5. Due to the robot information on the webpage, the following actions by webcrawlers are not allowed: using the description of the website from the Open Directory project. All other actions by webcrawlers are allowed.